I never fail to be amazed by how quickly time flies by. Can you believe we're in the last week of February? And I have done only one of the three bee blocks I have for this month. In part, this dereliction of duty is due to the inordinate amount of time I've taken to decide on a block for March, which is my month for the Modern Tradition bee. Joan had a great post the other day about how hard it is to choose a block. You want it to be simple enough for all skill levels, but still challenging enough to be interesting. And, most of all, you want it to have scope for the participants' creativity while still ending up with a block you want. And when a bee has a theme, as this one does, it adds yet another constraint. The MTQB has a loose theme, which is using modern fabrics with traditional blocks. 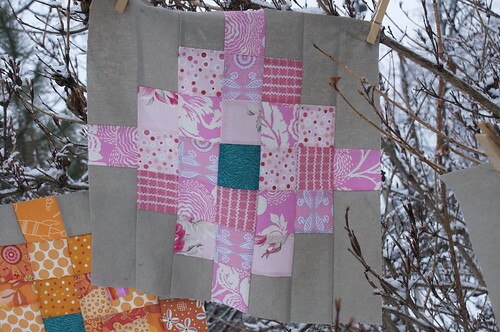 This is the first time I've chosen a block for a quilting bee, so I'm feeling the pressure! So, without further ado, here is the big reveal for March at the Modern Tradition Quilting Bee. 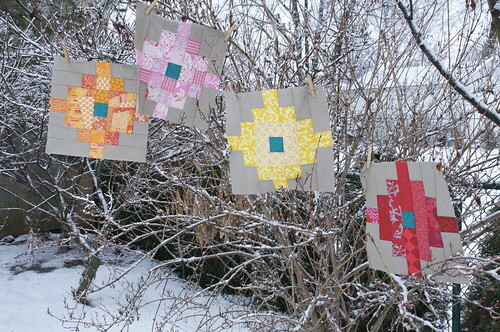 The block is called Granny's Flower Garden, and it's a traditional block from Marcia Hohn's amazing trove of quilt patterns. It's a 14" block, and I will be asking for a couple of monochromatic blocks in yellow, orange, pink and red, each with a green centre. The background is that wonderful Essex linen/cotton blend - I bought it from Jackie and I love it sooo much! The block in the pattern is strip-pieced using 2.5" strips, but I am encouraging the bee to approach this block loosely, and think of it in the different ways that this block can be drafted. I've made some sample blocks that show just a few examples of how that can be accomplished. 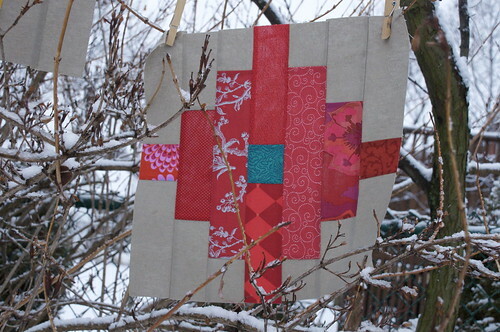 This scrappy red block is the true to the pattern, with strips of red fabric. It looks okay, but I like the others better. This yellow block uses only two colours, with an inner ring around the centre square. This means using some strips and some squares. The pink one is the result when the pattern is drafted as a set of squares only, no strips. Finally, the orange one is the most modern, because I made a biggish improv panel and cut two 4.5 x 6.5" pieces from it, then filled in the block with 2.5" squares. So that's what we'll have for March - I hope everyone in the bee likes it! What would you do to jazz up this block? Please post suggestions in the comments box! 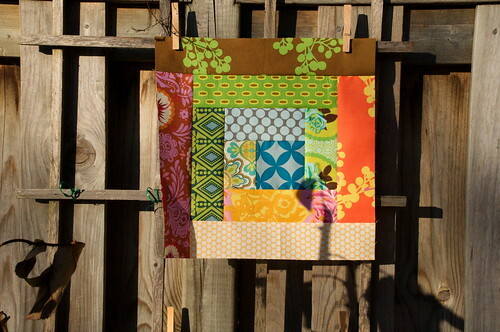 Am I a Modern Quilter? I ride a Vespa motorscooter, which was made in 2007. It is called a "modern Vespa" because it has an automatic transmission, unlike the traditional, or "vintage Vespa", which has a manual transmission, requiring shifting, like most motorcycles. With so few Vespa riders in North America, you would think we could all be friends, wouldn't you? But, no, the human urge to classify and establish Us and Them reigns, and there is significant factionalization between twist-and-go modern sorts and shifties who ride vintage scooters. Crazy and unnecessary? I think so. 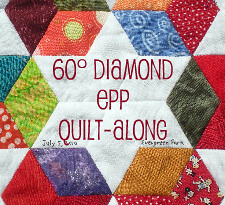 "Modern quilting" guilds are popping up all over the place. Not everywhere, not here, in the smallest outport of Ontario - but in bigger centres. And a question that is being asked of members is "what is modern quilting?" I'm sure you've seen this meme on many blogs over the last few weeks. Although there is no modern quilting guild for me to join here, I do think it's an interesting question, and one that I have considered off and on since I started quilting again. I read a lot of answers to the question that seem to be various riffs on "it's something new and improved over what they used to do in the old days". Personally, I don't think that's true - I think there are many more dimensions along which modern and traditional quilts are similar than they are different. And I'm left wondering why it seems to be important to draw this dividing line between modern and traditional quilting, when in fact all quilters together represent such a small fraction of women throughout the world. The question at the top of this post is a trick question. Yes, I am a modern quilter. And yes, I am also a traditional quilter. I make what I like, and I like a lot of things. Quilting makes me feel connected to the generations of women who quilted before me. And it makes me proud to know I am leaving a legacy for my daughter and family members who will have something made by my hands when I am no longer here. What about you? 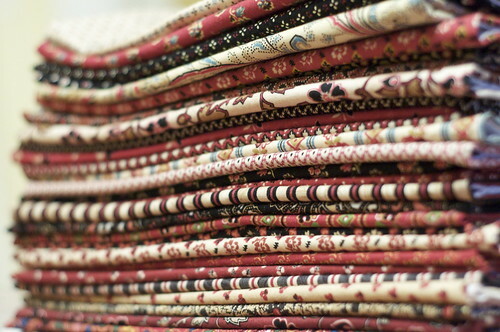 Do you see yourself as a modern quilter? 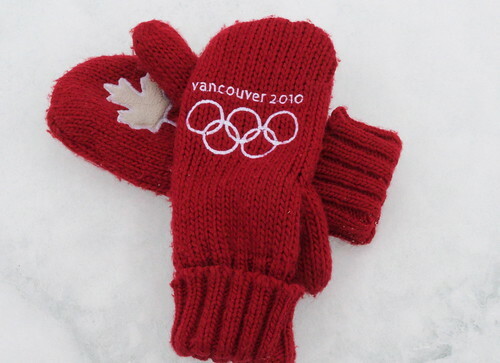 Nationalistic mittens, originally uploaded by Shadrach Meshach & Abednego. We are hosting a big party right now: the Olympics! At our house we are watching a lot of Olympic coverage; it's so unusual to see the Olympics when they are only three hours away, rather than the normal middle of the night on the other side of the pond. People sometimes ask me if I cheer for Canada or the US, and the answer is Canada! I've been here since 1983. I know my mother, may she rest in peace, would never have let me leave Tennessee if she suspected I would never come home. But I fell in love. Not only did I fall in love with my Canadian husband, I fell in love with this country. I didn't know anything about Canada when I applied to do my Master's degree at McGill; I didn't really understand at a gut level that it is a different country. And although I had taken two years of French at university, if I had really understood that they speak living, breathing French in Montreal, I would have been too frightened to make the leap. It was a big enough challenge to my timid soul just leaving the south! I became a citizen of Canada in 1995 (retaining my US citizenship, as well.) I've never completely adjusted to the Canadian winters, I must admit; I think I had passed the critical period for winter sports before I immigrated! But I do know the rules of hockey, from years of cheering for the Montreal Canadiens. Last night we cheered for Team Canada, as they beat the Norwegians 8-0; here is a photo of our cheering section. On the long weekend, my husband and I went down for a walk along the lakeshore. Lake Ontario is frozen solid. 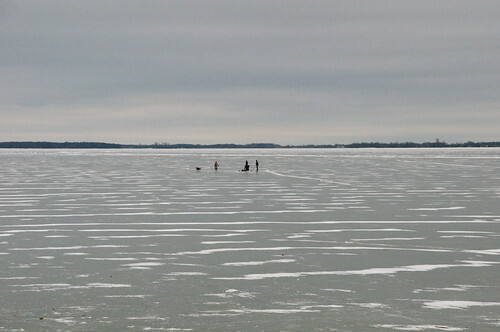 People were paraskating, the iceboats were out, and folks playing hockey so far out that they looked like ants from the shore. 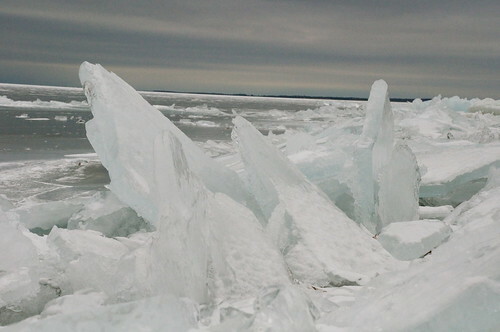 There are huge ice shards along the shoreline. We haven't had much snow so far this winter - all our snow seems to have been rerouted South. Thanks, guys! 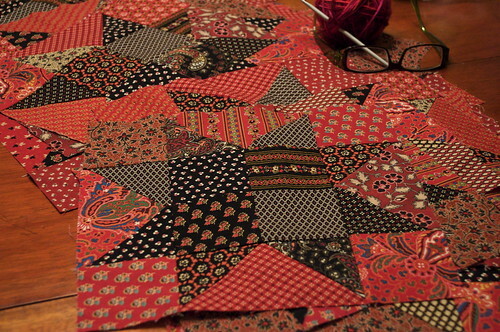 And I did get some sewing done this weekend - I finished all my black blocks for that red and black star quilt. Thelma has decided it's not for her, but I am really feeling the love. I'm still waiting for the remainder of the fabric I ordered to arrive before I can do the light blocks. This is going to be a favourite, I can just tell! 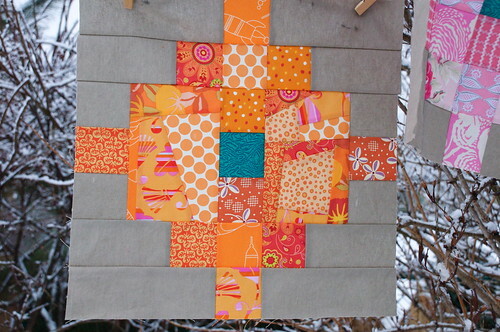 February Blocks for Modern Tradition Bee, originally uploaded by Shadrach Meshach & Abednego. 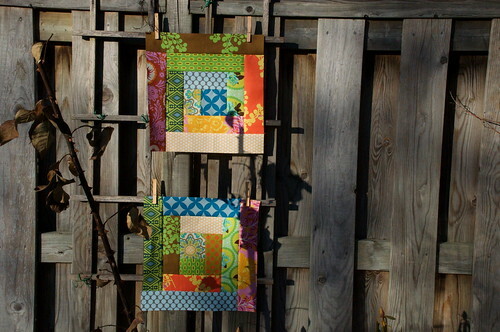 Here are Leanne's blocks for the Modern Tradition Quilting Bee. Leanne asked for regular old log cabin blocks, but there's a bit of a nontraditional twist with these. The centre block was 3.5" and all subsequent logs were 2.5" (all measurements before sewing). With a specified block size of 12.5", it meant that the final blocks are a bit off centre, with two sides having three rounds of logs, but the remaining sides having only two rounds. So, while the blocks are not wonky at all, they are a bit eccentric. In a good way! 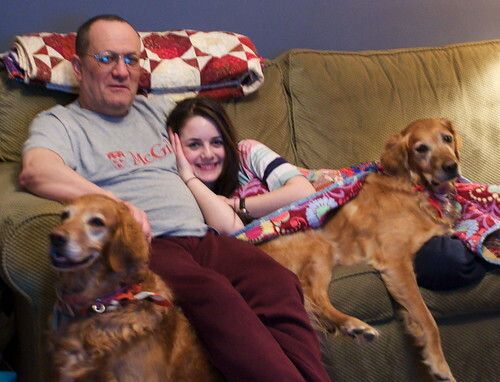 Monday is Family Day, so I'll have three days to make some progress on my projects. I'm looking forward to getting dug in with the 19th Century Reds. I need to quilt the lab quilt, as Lindsay reminded me in a comment on the last post. I also need to clear the decks of my remaining blocks for the two other bees I'm participating in. One of those is the dreaded New York Beauty, for Jennifer. I'm experiencing a clear case of approach-avoidance with that one. I want to try it, but I'm utterly intimidated by the spiky points and the curves. I'm sure there's no way I'll get all of this done, but it will be very satisfying to make a start. What about you? What are you doing this long weekend? 19th Century Reds, originally uploaded by Shadrach Meshach & Abednego. This has been such a busy term at the university! I am teaching both preservice teachers and graduate students this winter, and it's seriously cutting into my quilting time! Fortunately, the preservice students are finishing up this week and then going on a two month practicum. I could say that I will miss them, but that wouldn't be strictly true. My research lab is located right behind the music classroom and the suite of practice rooms, and this has been a source of great hardship for us lately. Not only are we an enforced audience when section after section of B.Ed. students learn to bang on garbage can drums and play recorders, we are also serenaded by various singers and trumpet-players who are under the mistaken impression that the practice rooms are soundproof. We live for summer, when it's blissfully quiet, although that's the time we get the piano tuner in, and it takes him all day of plunking key after key to get the several pianos ready for the new school year. Imagine the aural equivalent of Chinese water torture. But I digress. Two-thirds done, originally uploaded by Shadrach Meshach & Abednego. 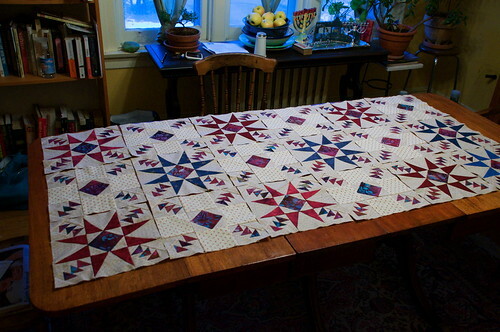 I spent hours working on this quilt this weekend, but it is such slow going! The flying geese at the corners of these blocks are mind-bogglingly tedious. It did, however, feel good to pull this out of the closet and make some progress on it. I have made about two-thirds of the blocks, but have to call a halt for now. I am out of the background fabric - Fairfax County by Jo Morton for Andover - and the LQS, where I originally bought it back in September, is out of it, too. I'll have to source it over the internet, and hope for the best as far as dye lots are concerned. Updated to add: Found some Fairfax County and it's on its way to me! And to say that the pattern is called Southern Skies, from Jodi Barrow's book, Leaving Riverton. Paprika quilt, originally uploaded by Shadrach Meshach & Abednego. Here is my next new project. This quilt, designed by Colleen Reale, is featured in the current issue of the Fons & Porter quilting magazine. I found out about it from Thelma, who is the loveliest blogger. She is celebrating her 100th blog post today, and this is one reason I am celebrating her in today's post. 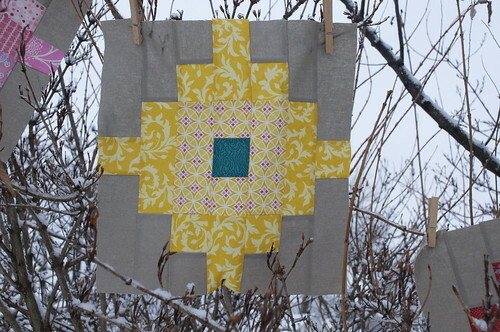 Thelma bought a kit for this quilt at a show recently, and featured it on her blog. I was immediately smitten. 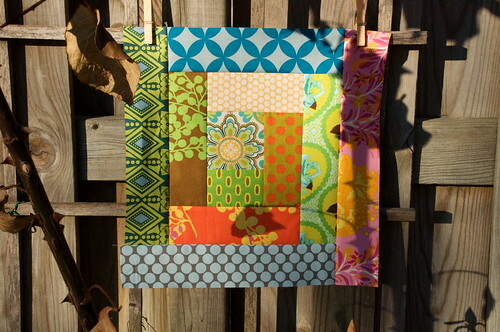 I have never bought fabrics to exactly reproduce a quilt in my life, until now. 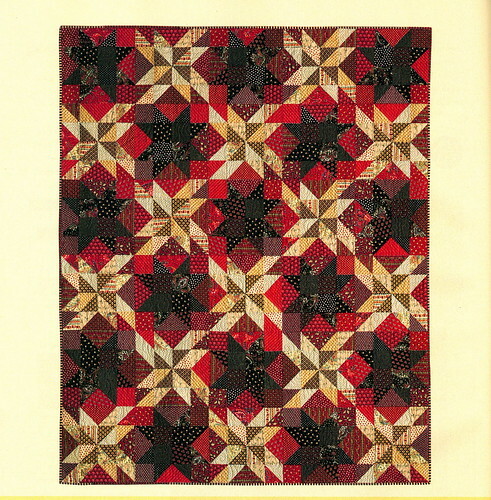 I am agog with quilty lust over this old line: 19th Century Reds by Windham. I don't consider myself a reproduction fanatic, and I really like modern quilts, but I'm learning that I really have a very eclectic taste. In this case, "the heart wants what the heart wants", to quote Woody Allen. 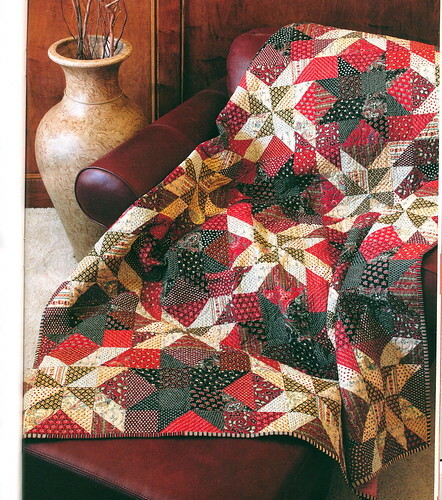 Here's another shot of the quilt from the mag. Thelma and I will make it together - she's already washed and ironed her fabric, and I'm waiting impatiently for the postie to deliver mine. It will be fun to work alongside Thelma in making this - although she works so fast, I'm sure she'll leave me in the dust! 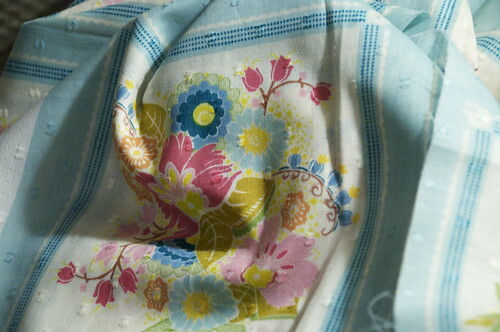 The other reason I'm celebrating Thelma is that I received the beautiful blue fabric that I won from her giveaway. I was gobsmacked by the gorgeousness of the fabric and Thelma's generosity - there must be close to 10 yards of blue, yellow and white fabric here! 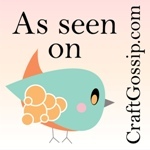 I know I'm not alone in enjoying Thelma's blog. She does beautiful work and her stories are always interesting and full of good information. If you don't know her, go and introduce yourself. Today would be a good day, as her 100th blog post giveaway defies description. One more thing - have you ever met someone from the blogopolis out of the blue? Over the Christmas holiday, I bought a quilting mag at our local chain bookseller. My daughter also had a few things, and we took them to the cash, where the woman at the till rang out our items and then asked me, "Do you have a quilting blog?" I was so taken aback that all I could say was "duh"! Annette, who is a local crafter and blogger, recognized my daughter from this post, and made the connection. I was so startled to see a virtual person take flesh! It was lovely to meet her so serendipitously! I saw her again the other night when I bought this F&P mag - cheers, Annette! so beautiful drape, originally uploaded by Shadrach Meshach & Abednego. I am in three virtual quilt bees this year. So far I have been making blocks for others, but my month in the Modern Tradition quilt bee is coming up: March, to be exact. That means I have to decide what blocks I want the other members to make for me and distribute the fabric and instructions among them. 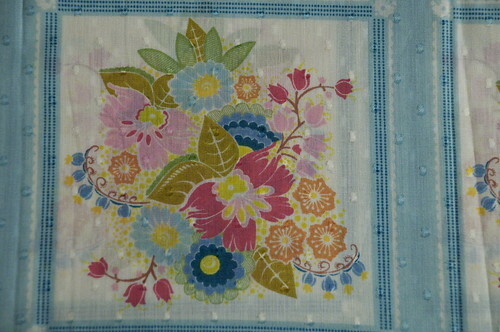 I've about decided I want to use this panel from Anna Maria Horner's Little Folks voile collection for my blocks. Each panel comes printed with 16 small (6") blocks and four large (12") blocks. Here's a better view of the pattern on the small block. I haven't decided, though, what kind of blocks to go with. Right now there are a couple of options that I'm considering, both yielding blocks about 14" in size. One is a wonky log cabin kind of thing, with the 6" block in the centre, natch. Sort of like this, or the bento box approach, like this (imagine this flower block where the unicorn is). What's nice about this is that it gives the bee members more scope for creativity, etc. But this is the Modern Tradition bee, wherein we think about using traditional blocks with modern twists or modern fabrics. So the other option is a more traditional block, adapted to feature the block in the centre. For example, here is a picture of a traditional bear paw, which could be drafted so that the voile block is in the centre and each "paw" has a bit of the corner cut out, to set the voile block in the centre. It would sort of give the effect of rays coming out of the four corners of the voile block. That would be more structured, more in keeping with the traditional aspect of our bee, but will it show the voile block to the best advantage? I'm sorry I don't have sample blocks made up - that would be best for decision-making, of course, but I don't want to sacrifice the voile. What do you think? I could go with the more wonky one for one of my other bees, if the voile doesn't work in the traditional pattern - my month for the Maple Leaf bee is April, and there is no organizing theme for that bee. Then the issue will be what block to choose for March. Life is so complicated!